“Mama, I’m scared,” intones my three-year old in a half-whine, half-cry as he clings to my legs. “A dragon?” I ask incredulously. This mama is no natural Braveheart. But years of trusting God have taught me that our posture in the world needs to be that of the overcomer. “If God is for us, who can be against us?” it says in Romans 8:31. “In this world, you will have trouble,” says Jesus, “but take heart, I have overcome the world” (John 16:33). And who could forget those famous rousing words to Joshua, “Have I not commanded you? Be strong and courageous. Do not be afraid. Do not be discouraged, for the LORD your God will be with you wherever you go” (Joshua 1:9)? How I wish I could tattoo this on his heart! If I could speak anything deep into the core of my little boy as he grows to be a man, it would be this. If God is with you, you need not fear. It’s not that scary things won’t happen. It’s not that you will be immune from hardship or pain. But if God is your friend, you will never face anything alone. If God is with you, you can count on the fact that no matter what evil you encounter, He has already had the ultimate victory. Evil can only go so far and no further. Its days are numbered. I’ve read the end of the story and good wins out. Oh, how I want him to know that deep down in his bones. Because I want him to enter the world bravely, not as one who must cower back in fear, but one who goes with confidence. I want him to enter the world not as one who goes with the foolish arrogance of impermeability, but as one who goes with courage even in his frailty because he does not walk alone. Maybe, if we rehearse this often enough, we’ll both learn to play our parts with boldness. 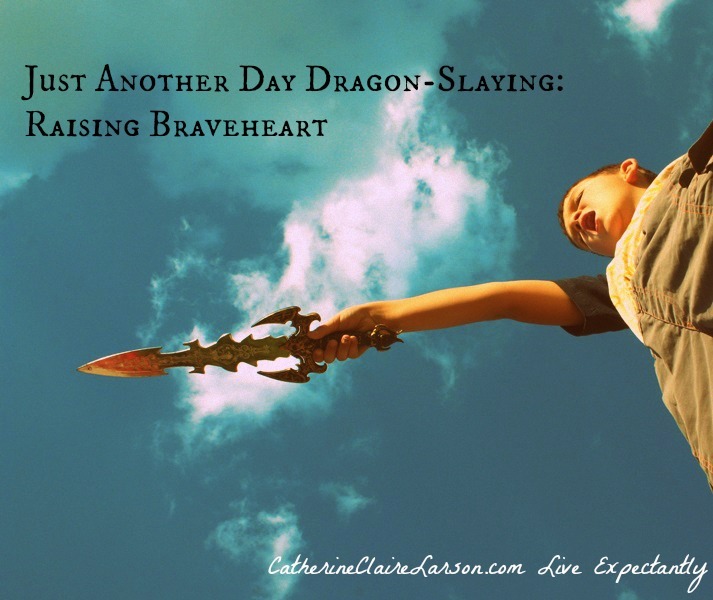 Maybe, if we keep practicing standing up to the dragons, we will learn to carry ourselves like the overcomers we are. No, in our house, dragons will not have the last say. In our house, dragons are the ones who must flee. Maybe all of us could use a little rehearsing.